This plaque celebrates the birth of my niece! It is carved in cherry and then painted. 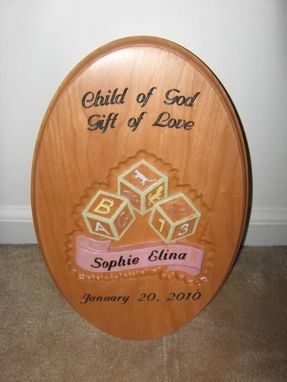 If you'd like one to celebrate a birth, we can customize the names and dates, and can modify the text at top to customer requirements. We can also change the wood, though I would suggest keeping the wood color in the lighter brown range to allow the carving and the carved letters to be more visible.